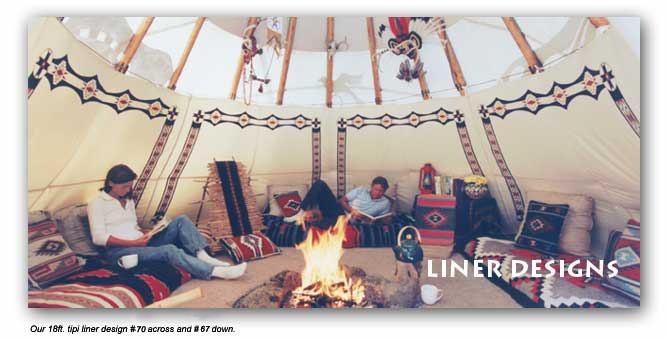 The liners for all tipis come in three large pieces that we call liner sections. Each liner section is made up of individual liner panels that are sewn together to make up the liner section. We offer thirteen different Liner Decoration designs (#63 – #75) for your liner, available in Solid Color or Antique Wash style. 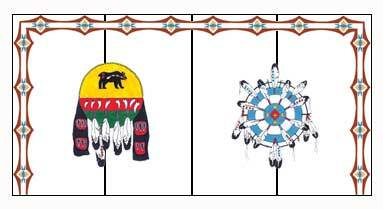 The designs are taken from beaded and hand painted liner designs from various tribes of the Great Plains Cultures. Often a different design is used for the horizontal lines vs. the vertical lines. You can mix and match the 13 different designs however you like. 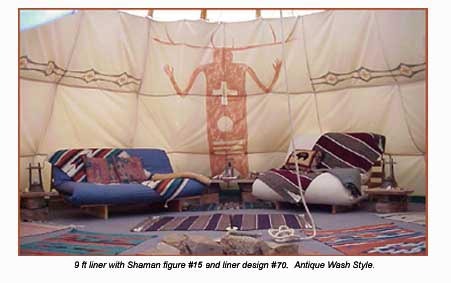 Shields, Pictograph and Shaman Figures may be used with the liner designs as well.. The sample layout below shows one section, the middle section, with four liner panels. Each one of our Liner Decoration Strips (#63 – #75) is designed to span one liner panel. In this example, four liner decoration strips span the top of the four panels. Two additional strips run vertically down each end of the liner section. This is a total of eight strips of liner decoration #74. For example, the cost then would be 8 x price for the liner decoration on this four panel liner section. Using the price of $13 for liner deco strip#74, it would be $104 for what you see here. Shield design #53 and #54 have been added to enhance the overall design. 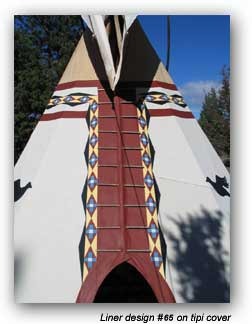 The photo to the left shows a liner design painted along the side of the tipi pinning stripe. 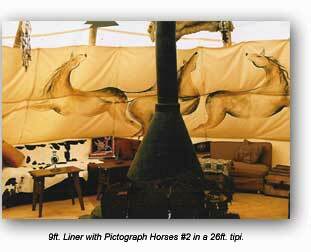 Costs vary depending upon the number of liner decoration strips utilized. This shows design #64 used four times. The cost for this decorative border to the Pinning Stripe, painted as you see it, is $52. 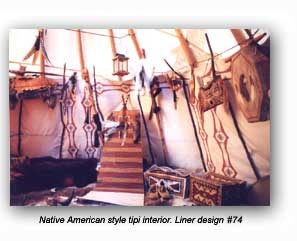 The photo to the right shows liner design #65 used to border the pinning stripe and also to create a colorful decoration band around the tipi. Below you will find a blank diagram for designing your liner. 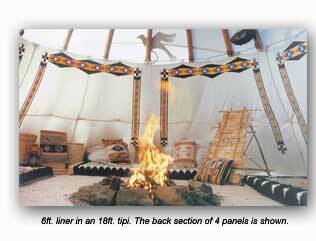 The number of panels per section depends on the size of the tipi. 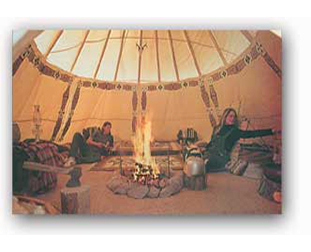 You need to choose the liner section sequence that corresponds to your tipi size. You will find a layout for all sizes: 14ft liner: 3-3-3, 16ft. : 3-4-3, 18ft. : 4-4-4, 20ft. : 4-6-4, 22ft. : 4-6-4. You may choose to decorate only the middle section of your liner or you may want to decorate all three sections. Knowing the total number of panels per section, you can design each section. One Liner Decoration Strip goes across one panel. 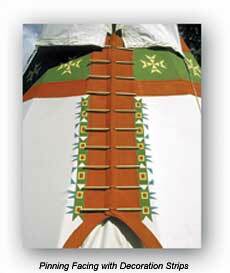 We suggest that you use two Liner Decoration Strips to go down vertically, although you may use only one if you like. In addition to the Liner Decoration Strip, you can add some Center Designs e.g. 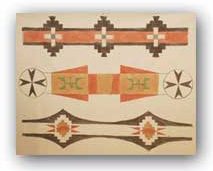 Shield Designs, Pictographs or Shamanic Figures.